Control of 2D user interfaces with 3D devices (virtual mouse). The SCD within STFC is having Away Days in April and collated together with a five year plan for the complete Department. The Visualisation Group has a technology division strategy outline and operational plan but produces a list of future areas of support that include the concept of keeping the Human always within the Visuallsation loop. The Visualisation Group, part of the Technology Division within SCD, was founded to support and maintain visualisation software and skills for large projects and user communities. providing specialist local high-end equipment within the centres that are near to the main STFC image capturing x-ray, neutron and laser facilities. The group is working to support the high-end visualisation centres within STFC, with the key objective to consider the human-in-the-loop as an integral part to pre- mid- and post-data visualisation needs from the major facilities, from archived data stores and from computational simulations. This it is believed is a key component to increasing the efficiency of the major STFC facilities allowing researchers’ work-plans to be controlled, changed and even stopped on the fly. range of Research Council projects with other teams and groups within SCD and STFC. 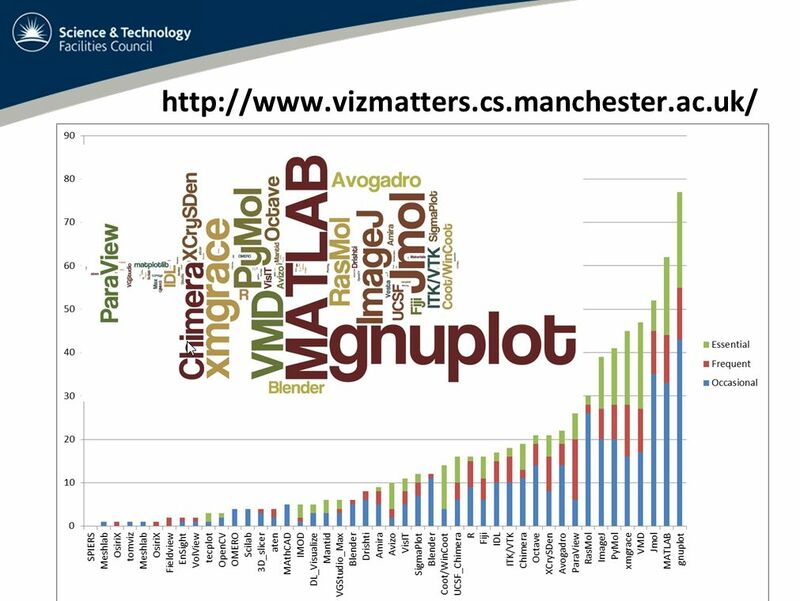 At the end of 2014 we analysed a Visualisation Tools survey for certain HPC and computational users. Three packages are the most-used packages by 26% of respondents. Conversely, another 31 packages are used by one or two users and account for a further 26% of respondents. Producing publication quality plots is the most-used technique. – Software that is written specifically for their domain of interest. – Large datasets are handled efficiently. – Scripting or other ability to extend the tool is required. Users second most favoured packages are general purpose visualisation tools. Users were given five options for selecting their most required development. None emerged as being more needed than the others. Conversely, large amounts of memory was clearly the most important requirement for high performance visualisation. – The ability to operate in a distributed environment. A series of further surveys and follow-up questions are planned as well as afull review next October (2015).